This week we are focusing on not only iOS/Android applications but how to use React in native Mac/Windows/Linux applications as well. We cover a few IDEs and tools that are useful for building native applications and highlight some interesting libraries that can accelerate your development. We've also featured a few boilerplate repositories to help you get started with your next native app. Nuclide is a package built with React and Flow on top of the Atom IDE. It has some really compelling features like autocomplete and type hinting. It also has integrations with Chrome DevTools and Flow to make debugging easier and ensure your code is error free. Jonas Gebhardt at the React Europe conference this year gave an overview of all the great features of Nuclide. Electron is an open source platform built by Github. A wide variety of desktop applications are built with Electron--some that you probably use on a daily basis such as Slack and Atom. Electron uses the Chromium engine and Node.js. If you're already well versed in building React application for the web, building a desktop application can now be just as easy, or even easier since you no longer need to worry about cross browser compatibility. To get started, check out the quick start tutorial on Electron's website. Deco IDE is software that helps you build React Native components. It has a drag 'n drop interface that allows you to select from a number of commonly used components such as date pickers, nav bars, images and progress bars. It's also got a tool called a property inspector that allows you to adjust the defaults for your components. Redradix is a development agency that has built several React Native applications and has written up this article with recommendations for the tools needed to build a React Native application. This repository a great collection of React Native demos and examples. It is inspired by another developer's 30 days of Swift. This collection highlights a number of common techniques in mobile development. Carbon Native gives minimal styling to your UI components. It includes buttons, badges, cards, icons, styled lists, togglers and even typography. It's a great UI kit to get some basic styles. 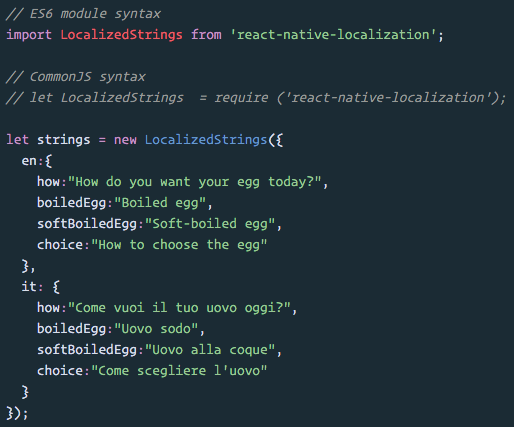 This library gives you a simple way to internationalize a React Native application.